Since moving out of suburbia we have really started to appreciate the seasons. Previously I would never really appreciating what they give us. That’s certainly changed for us as we’ve learned about the key growing times, how different seasons help you out and how each one brings new challenges to overcome. Our challenges so far have included waterlogged fields, a lack of shade for livestock and frozen water tanks, and this week we’ve had a couple of these typical challenges to deal with. As the autumn set in I purchased a tombstone ring feeder for our Highlands, so they could feed without getting those fantastic horns caught up. Anyway, due to the weight of the feeder I can’t lift it alone to replace the round bale inside. Well, with me not being ‘as green as I’m cabbage looking’ (as my Grandmother would say) I wait for one of our unsuspecting sons or son-in-law to come by at the weekend to assist me in this little task. Last weekend, when that really cold wind was blowing, the job was a bit more of a chore than we’d bargained for. We rolled the fresh bale out to the field, flipped the feeder ring onto its side and positioned the bale on its end as normal. That’s when things started to go belly up. I looked up to see, to my horror, that the strong wind had taken the feeder ring rolling rapidly across the field towards my new post and rail fencing, which had already cost me an arm and a leg. We ran as fast as our legs would carry us and eventually stopped the feeder before it ran through the fence. I did get dragged for several metres and smelled absolutely lovely afterwards, but to say I was relieved is an understatement. The other challenge started as a mystery. As normal I did my evening rounds but was perplexed to find that the cattle and sheep had switched fields! 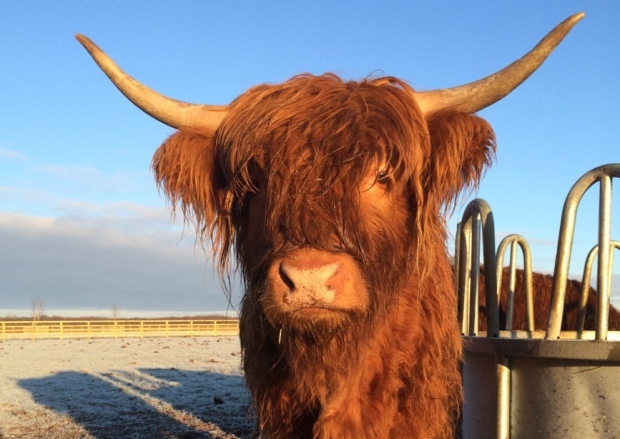 Turns out, our friend Torridon, the ram, had hit the gate so hard that he’d broken the latch, leaving him to go and visit the Highland cows he’d taken a shine to over recent weeks. Clearly the ewes were not enough for this ram, but maybe that’s a different season altogether! Challenges aside, every season has blessed us with so much. This is often mentioned by those who visit us on the farm, who comment on so many beautiful things that we could so easily take for granted – from our swathes of snowdrops, the stunning sunsets we regularly see, to the countless wild birds we have visiting us. This past week has been a busy one with Wendy spending much of her time working on her insect hotel and preparing greenhouses for the forthcoming onslaught of potting and planting. I, on the other hand, have been tasked with investigating ways to improve our energy resources and heating systems in the farmhouse including, better loft insulation, solar power and biomass boilers, as there must be a better way than lumping buckets of coal back and forth to the antiquated heating stove in our kitchen. Anyway, with the slight reprieve in the cold weather over the last couple of days, we have taken the opportunity to get our colossal pile of bulbs planted out. Now that makes three things I just can’t wait for: Spring to arrive, the bulbs to grow, and, our new piglets to arrive later this week! Wahey!